“CONTROL” IS WHAT THE AIPAC ZIONIST JEWS are all about. 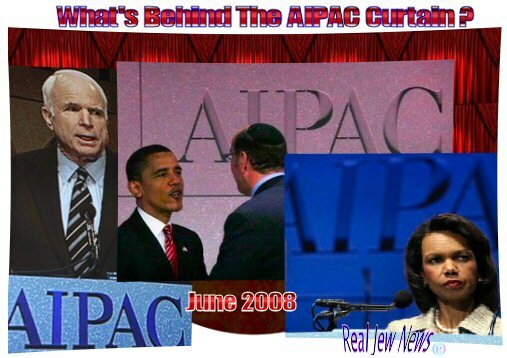 Is it then any surprise that the June 2-4 2008 AIPAC Policy Conference with 7,000 attendees including 300 from Congress was a media blackout? The business of wielding influence is what American Jewry is all about. And American Jewry prefers not to have this made public. This was brought home to the American Conservative Magazine journalist, Phillip Weiss. At his very first AIPAC Conference this year, Weiss was demanded by AIPAC officials while writing down his report to show his credentials. Indeed - all with political ambitions to remain in power came to the Conference to be accounted for before the influence-wielding Jews of AIPAC. 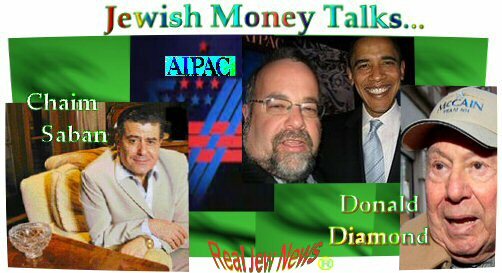 AIPAC’S WEALTHY JEWISH DONORS were featured by flashy banners displayed in the main hall of the Conference, Phillip Weiss reported. — “The Jewish community is a family and we have to take care of each other” — Here. Another wealthy Jewish donor featured, Weiss reported, was the toymaker Chaim Saban. He was granted center stage when speaking before the audience wearing a flashy platinum tie, white shirt, and silver suit. — “Are the world’s greatest atrocities now attributable to Jews?” — Here. If this question is not answered soon, groups like AIPAC will make our entire political system one great Zionist atrocity! When AIPAC go around, soliciting Members of Congress and Senate to attack Iran…. When AIPAC accept NO Responsibility for their criminal behaviour or actions…. THE UNITED STATES ELECTORATE HAS TO WAKE UP!!! BUSH / CHENEY / ROVE / RUMSFELD / RICE / POWELL / WOLFOWITZ / FEITH / PERLE / etc., etc., etc. ARE ALL WAR CRIMINALS!!! SUPPORT CONGRESSMAN RON PAUL’S CAMPAIGN FOR LIBERTY!!! Such a shocking, sickening display of war-mongering and hate, to see America dragged to this war as a wretched Golem in chains behind the triumphal chariot of the Jewish Internationale. The media blacked this out because they did not dare to let the public see such a spectacle. Not for nothing did Pope St Pius X express the desire that the “true image of The Holy Face upon Our Lord’s Shroud” be published and seen around the world in honour of the desire of the Sacred Heart of our King. America is more of a colony under Isreal today than it was under Britain. In fact those who controlled Britain, the Rothschilds control the US and using the US like the UK to conquer the world. Americans are pretty retarded that it so painfully obvious that every major social structure, media and news is controlled by jews just by looking at there names. If they cant realise that the Iran war is a war for Israel then theres no hope for the US there to dumbed down to even bother. I’ve noticed how no one ever calls Jews communist or Neo communists its either zionists or zionazis. The biggest mass murderer in history wasn’t Stalin but his jewish father in law Kagagnovich. Stalin gave the go ahead for the 5 year plan project but it was Kagagnovich who actually planned and organised the operations like blowing up orthodox churches, the Ukrainian famine, etc. Your and the nutty professor’s view of Sacred Scripture is insulting to the Christian faith which regards the Septuigant as inspired by Holy Spirit. For your information, the prophet Moses, together with the prophet Elias were both witnesses to the glory of the Lord Jesus Christ on Mount Tabor. You and the professor, on the other hand are witnesses to the pig stye and crap heap. Jesus was ’sold out’ for a mere 30 pieces of silver. Takes millions and stolen billions and trillions to ’sell out’ peoples of entire nations such as the US, Iraq, etc. Knowing or speaking out about the Zionist influence on Congress and the Federal government is an anti-semitic thoughtcrime. The garish Jewish display of wealth at the AIPAC convention, to which all politicians made pilgrimage in order to bow, scrape and worship, and how Jewish Zionist wealth has been used to buy off corrupt Washington, which then sends out US forces as mercenaries for Zionist expansionism, are perfect metaphors for the disgrace that has befallen the new, money-worshipping America. As America has slowly traded in its Christian heritage and idealism for worship of materialism and the Almighty buck, an insidious, conscious process that has been ongoing now for decades, it has steadily opened itself up to corruption by the Judeofascists and their like-minded allies, in what should be viewed as an almost organic, inevitable outcome. Have American money-worshipping inclinations been accelerated by the infiltration into the US establishment of the ultimate self-worshipping and money-worshipping people in history, the Judeofascists? Absolutely, but they merely exploited a tendency that was already there. It seems, as with vampires and the cross, the only way to ward off selfish, greedy, tribal historical forces and their assault on civilization is through the maintenance of a strong Christian identity. Those individuals and societies that forsake and reject, or slowly drift away from that identity, leave themselves open to all manner of malevolence that eventually will destroy themselves and their progeny. American elites believe they can replace the Christian ethos with a different kind of universalism: materialism, markets, secular humanism, and globalization — the New World Order agenda. The only nod that some of these are willing to give to Christianity is Judeo-Christian Zionism, and a veneration of the quasi-fascist Zionist state. They are sadly mistaken, and are leading the world towards savagery and the end of civilization. We are only seeing the first taste of the results of their agenda with the violent turmoil in the Mideast, and now economic turmoil at home, which also will eventually lead to savagery and violence here, and perhaps has started to already (just look around). Extreme Christian measures have become necessary to restore order and save civilization. This means a crusade-like routing of the corrupt elites and their Judeofascist partners. Anything less is, metaphorically speaking, an acquiesces to Satan, who is being served by New World Order-thumping Washington, Brussels, and Tel Aviv. 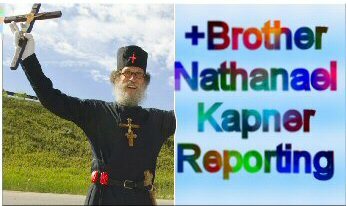 PS: Congratulations to Brother Nathanael and RealJewNews.com, which according to Alexa rankings is consistently breaking into the top 100,000 web sites worldwide, is in the top 75K in the UK, the top 50k in the US and Australia, and the top 35k in Canada. It seems Western civilization has rekindled its interest in Christianity, and is getting ready to throw over these Judeofascists and their corrupt New World Order allies. My advice to fence-sitters would be to get on the right side of history now, because a change is coming, and the enemies of Christian civilization are going to have to account for their treachery. I’ll sign on to these comments, with a caveat. Love is long…life is short. Get along, or I’ll do it for ya!!! Kids with guns. Kids with computers. This Bro Nathanael has a pair of balls that an elephant couldn’t drag around…love ya buddy!!! A “comment?” there it is. Good point thats what I’ve been thinking I dont like Jewish extremist who subvert society for there own benefit but at least I can understand they are representing there own group interest. Its these Judas non-jews who court and promote the jewish agenda for privileges and career advancement that I despise the most like John McCain , Christopher Hitchens, Jerry Fallwell, etc. You dont seem to have a permanent link on your website to your other religious christian website. Nobody will know it exists! Its interesting to clarify topics with posters Lynda and America, the Beautiful about christianity especially concerning new revelations about jewish behaviour and group strategy. Why is it that only Jewish people want war? Correct me if I am wrong, but wouldn’t there be world peace if it wasn’t for the zionists? As for these parasites that have more power over OUR elected officials and the appointed than We The People, is the reason election reforms fail every time. Big business broadcasting corporations are the ones that make out like bandits each and every election. Do you think they will ever report about attempts to fix this system, returning it back into our control and benefit? This same big biz, has kept the lid on certain crimes that must be fully investigated or organized crime will be our doom until the end of civilization itself. The black market capitalist is running wild right now. Excellent post; I enjoy your website very much Mr. Kapner. These filthy scum have the greatest scam going. They send the money to Israel as foreign aid and then have the money come back to them as contributions. Of course the thief in Israel skims a little off the top for himself. One of these swindlers did the same trick with charity contributions to Israel. They should have named that movie “Swindlers List”, it would have been more accurate. All evidence points to these pigs having a hand in 9/11 too. Isn’t that wonderful, we have to financially support the very filth that did 9/11. They think everyone one was fooled by their sloppy false-flag. No, only the hillbillies who watch Fox news were fooled. I’ll agree that Jews are “tribal” and stick together. But my experience with my three (non-Jewish) wives is somewhat similar. Only their blood relatives and expecially their children seem to matter to them, even though they are not trying to take over the world. Ideally, Christians renounce family ties in order to embrace their new family in Christ. But I caution you, this is merely an ideal, seldom reached by the ordinary Christian, or even understood, at least in my personal experience. Which Christians are “renouncing” family ties in order to become Christians? I thought strong family bonds were the basis for christain values. Traditionally strong christain countries especially catholic ones have large family groups like Italians and Mexicans. Although not as large as the average muslim family. Did you have about the new senate approval of billions more money to holocaust survivors as part of some pension sceme? US tax payer foot the bill of course but the average US citizen approves anyway so I guess it doesn’t matter. Re: Your July 15 post. The American taxpayer can not approve of the Holocaust Insurance Accountability Act of 2007 - now before the U.S. Senate - because they don’t know about it. There is a media blackbout on this Act sponsored by Rep Robert Wexler (D-Fl) and Ros Lehtiner. The Dysinformation Industry promotes Congressman Wexler as one of the good guys. He called for Cheney’s Impeachment and those Hearings (a media stunt) have now been consigned to death by committee. Connie Rice went to Denver University, where she was mentored in Zionism by Madelaine Albrights father. She was provided a lesbian lover who is a Jew, and whom she owns a house with in Stanford. Zionists to the left of me, zionist to the right of me, here I am. Connie Rice is no Christian, nor is Bush. Look up ’scroll of bush’ on the web. Chabad Rabbis just named W. Bush, Prince of the Ashkenazi, and told him he must not divide Israel. Personally I think the Arabs and Jews need to make Peace with each other, and the Arabs should aknowledge to the Jewish people Jerusalem is what Mecca is to the Muslims. That said, the Zionist Jews must stop fomenting all these wars and pitting one people against each other. The world is wising up. Heres the youtube link to Wexter senate address on the issue http://www.youtube.com/watch?v=b3Zk0gr-EIo. Off Topic but former Yukos CEO Khordekovsky(jew)is being sued by a widow of a major of a Siberian city that got snipered after complaining that he was involved in tax fraud. I will certainly look at it and I hope many of Br Nathanael’s readers will too. This is very important and will certainly cost the American taxpayer billions of dollars - conservative est. upwards of 100 billion. Once this becomes known it will certainly fuel hatred / revolutionary acts against Jewish Americans (a.k.a ‘Lesser Brethern’) and I am sure this is the point of the entire exercise. Let us hope the Christians will call for the repeal of this law and enactment of just laws that are impartial and Constitutional. Look, we all know 9/11 was an inside job. we know that not only our government implemented the acts as a way of restricting our freedoms. but to blame jews as a blanket, all encompassing evil is wrong on so many levels, itâ€™s a ridiculous joke. isreal is being controlled by the thirteenth tribe. the tribe of dan is in control (for those who donâ€™t know, they were expelled from the rest of the twelve tribes because of serpent worship) and they are the ones instituting the â€œone world governmentâ€. just like ninety-five percent of freemasons have no idea what the five percent is really doing, the same can be said of the jewish nation. the tribe of dan is still worshiping a false god, and forcing it on the rest of the world. it is in everything from games to saturday morning cartoons. get over your inherent racism, jesus was a jew. he wasnâ€™t a skinny hippie looking white boy who worshiped in the same way the catholics or baptists do. he followed and truly enforced true hebrew customs (all except the worship of god strictly being in a synagogue) and was raised in to hebrew custom. the traditions you follow are handed down to you from truly pagan roman and babylonian customs (i.e. easter is worship of ishtar, christmas is the yule celebration passed down and changed to convert druids during the winter solstice) st.paul was a heretic, peter was a roman control freak. i welcome the anti-christ, hoping heâ€™ll hurry the frack up and get the ball rolling, simply because the sooner he takes over, the sooner Yeshua (his hebrew name) will return and take control from him. bring it on, iâ€™m tired of waiting. but to discount jews as a whole is ignoring the scripture proclaiming that in these last days, many will come to him and proclaim him lord. their eyes will be opened and they will see the truth. do you really think you will see the kingdom with racist crap being spewed on this and many other pages? â€œfor none are worthy, no, not one.â€ that includes you guys too. mind you, i am not saying to convert to judaism, but be mindful of those you condemn, because you are no more worthy than those who worship the shaitan and moloch. so far, i have read and pondered all this blog has had to say for a couple of months and all i see are a bunch of xenophobic, racist hateful remarks trying to say we can stop something GOD has set in motion. who do you think you are, to stop the ineffable plan, laid out before we were conceived in our motherâ€™s womb? how arrogant you are. if he were to appear to you and show you his wounds and tell you he was a jew, would you believe him, or would you go on hating jews the way you do? Here is a URL link to the “Bush Scroll”. you are lost and misled on so many levels, I pray that God will set you straight and that the Holy Spirit will convict you of the Truth. God delays coming so that All might be saved. Were He to hurry, more souls would be lost for all eternity. But that does not seem to disturb your impatient self. If you were able to see yourself spiritually at this moment AND the consequences of that spiritual condition — you would beg God for TIME and MERCY to change. This post on behalf of the gnostic gospel of Judas is a disgrace. Your ignorance is exceeded only by your confusion. To this unhappy state, you feel entitled to add ill will to the House of Faith. So, according to your lights, the persons and orgs documented on this website should be properly designated as what? ‘The Tribe of Dan.’ You can’t be serious? The persons and orgs whose activities are documented on this website designate themselves as Jews. Their own community so designates them, as do outsiders. At a fundamental level, Agent Xzero1, you have to at least respect people enough to designate them by the name they call themselves. However, the persons here named are not, however, Judeans - they are a nation of Caucasian race choosing to designate themselves as Jews. That is confusing enough without adding your recommended label. Jesus was not a Jew. He was a Hebrew of Galilee of the Tribe of Judah - a Semite. For your information, The Christians writing here do not follow pagan, babylonian customs. The Christian Paschaltide or Eastertide (designated seasonally) is not about ishtar worship. Show us one reference to Ishtar in the Eucharist for Paschaltide. Christ’s Mass is not about the Druid Yule. So what if Christians burn an oak log during the seasonal Christmastide to mark the passing of the old year. So what? This holy season of the Church’s liturgical year in which the Mass of our Lord’s Nativity is celebrated has nothing to do with pagan European religion of sun return, the days outside the year, Saturnalia, the Hunter etc. Solstice is an astronomical fact. For you to assert that this is the import of Christ’s Mass to the Christian faith is a lot of phoney baloney. You would not know heresy, Agent Xzero 1 if it smacked you in the head. According to the Apostolic Testament to our Lord and the Church founded upon Apostolic Tradition, the gnostic gospels are heretical - that is people choosing to make up their own stories and believe whatever they want outside the doctrine of the Church. Paul was not a heretic. He was an apostle ordained by Twelve in Jerusalem. He was martyred for the faith. The Council of Nicea was expressly called against the Arian heresy such as you freely pontificate. You are an ignoramus and an anti-Christian bigot. The stuff you have spewed onto this website, I seriously doubt you would dare to unload against any other ethnic or religous group. For the infinite merit of the Sacred Heart of Jesus and the Immaculate Heart of Mary, I pray that our Lord will grant you the grace of faith in him as the Way, the Truth and the Life. It is not too late for you Agent Xzero1. Are you sure it is not because he smokes cigarettes right now that he is delayed? If it were not for that godly justice you and others await, there would be justice here on Earth. 9/11 was an inside job that had zionists as the core of planners/supporters in the bushCo crime syndicate. Aipac, Israellobby, 50 min doc. A must see. You can start at 25:00. If nothing else, watch Richard Perle 32:00. He is a jew and leding NeoCon and he tells how jewish power works in America. Blunt and no bull. Israellobby 50 min doc at Robert Lindsay blog. He is jew-wise and has writen some pretty good stuff about jews. Some is excellent and that is because he take no bull from the jew mafia. Look at bottom LABEL. He has a lot about jews and Wikipedia. Brother Nathanael, Why did Guiliani, Edwards, McCain, Romney, and Gingrich(5 potential presidential candidates meet in Herzilla Israel prior to the election back in the spring of 2008?……They swore their allegiance to Israel prior to the primary, and danced for campaign contributions like little puppets! Have you no information on these U.S. candidates that seek the blessings of those that can not even vote in our elections?